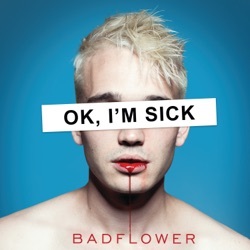 Ok, I'm Sick is the debut studio album by Badflower, released by Big Machine Records on February 22, 2019. From the chaos of “x Ana x” to the swelling instrumentals of the closer, “Cry,” Ok, I’m Sick can turn any music fan into a Badflower fan. Frontman Josh Katz’s vocals are a joy to listen to and steals the show. It’s a powerful release – Badflower have crafted an album that is bold and tender in equal measure. If there’s a band that desperately deserve to succeed and catalyse some real change more than any other, Badflower would be it. From start to finish, the album takes you on an emotional ride jumping from hit to hit. As it is, I can enjoy them for the great music and fresh melodic approach to songwriting. Simply put, Badflower demonstrates a wealth of versatility on OK, I’m Sick, and it’s sure to bring the band even bigger audiences as the year rolls along. OK I’m Sick is a great debut from a band who will be admired for several different qualities. Badflower’s much-anticipated debut “OK, I’m Sick” is a well-built bundle of contradictions. Blown away! One of the best modern rock bands today! Promise Me New song Promise Me is my new favorite. Everything these guys put old is amazing! Love this!! Great music can’t wait for the rest to be released!!!! Love Love these guys!!! They rock!!! Badflower pretty good so far So far i like it. I have the previous EP so i am familiuar with Haroin. The first song is growing on me as well. I hope for a little more "rock" feel like their previous stuff. Looking forward to the release. If you don't want to wait, check out the previous EP. Exelent.